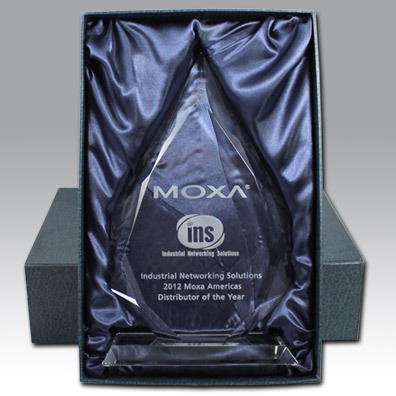 Industrial Networking Solutions (INS) is pleased to announce that it was awarded the 2012 Moxa Americas Distributor of the Year at the 2013 Moxa Application & Technology conference held in Newport Beach, California on March 7th. INS won the prestigious award after just three years of distributing Moxa products. The Moxa Americas Distributor of the Year award was presented to INS based on sales volume, breadth of customer base, and customer satisfaction. Leading up to this award, INS was awarded Moxa Regional Distributor of the Year in both 2010 and 2011. Headquartered in Addison, TX, Industrial Networking Solutions distributes industrial IT products and solutions to industrial vertical markets end-users, integrators and OEMs. The company focuses on value-added solution sales, offering its customers robust industrial communication products as well as industrial IT engineering services. “Our customers depend on quality equipment and knowledgeable sales, service and support. Moxa offers a wide-range of quality industrial networking products, while INS employs an experienced team of sales and engineering representatives,” said Mike Finley, President of Industrial Networking Solutions. “Our partnership with Moxa has benefited INS with exponential sales growth and greater market exposure. We’re honored to be awarded Moxa Americas Distributor of the Year and pleased to promote the Moxa brand”, Mike continued. Moxa manufactures device networking products for industrial automation. Information about all Moxa products, which include industrial embedded computers, industrial Ethernet switches, serial device servers, multiport serial cards, embedded device servers, and remote I/O, is available on Moxa's corporate website at www.industrialnetworking.com/Moxa.